In a city yet to name a back alley after Coco Chanel, Parisians stepped out Sunday to do their organic shopping at a street market named after fashion designer Sonia Rykiel. 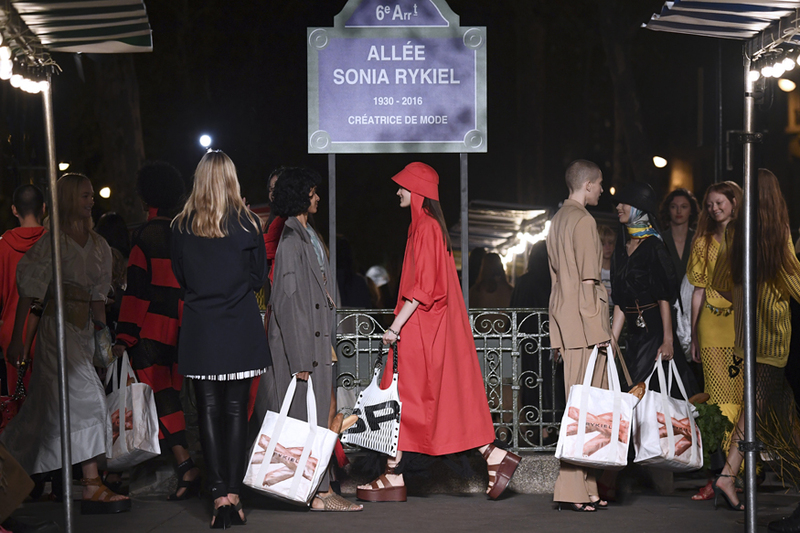 On Sunday, the city's mayor Anne Hidalgo -- something of a fashionista herself -- had declared Allee Sonya Rykiel open, with her label staging its Paris fashion week show between the twinkling lights of the market stalls. The "allee" is in the middle of a grand Left Bank boulevard where the late designer, who died in 2016, did her fruit and vegetable shopping. It is the first time the French capital has named any kind of thoroughfare after a fashion designer. To celebrate, Rykiel's successor Julie de Libran staged a chi-chi Parisian market-themed show, with models carrying baguettes or popping out for a bit of broccoli in lace nighties and techno trenchcoats. The collection, with dresses inspired by the "petit filet" string shopping bags that are de rigueur among Paris' hipster "bobos", had a Saturday night-Sunday morning feel, with a cute terrier on a lead and De Libran's young son and his Labrador pup making a cameo. "Sonia Rykiel gave us a taste for freedom, she was the most Parisian of Parisians," said Hidalgo. Indeed the designer opened her first shop a stone's throw away in Saint Germain des Pres just as French students rose up in revolt in May 1968. But the authorities in the French capital would not be drawn on whether there were any plans for a Boulevard Karl Lagerfeld or Avenue Christian Dior. A street named after Chanel would be politically tricky in a city which mostly votes for the left because of the designer's "horizontal collaboration" during the Nazi occupation. Paris has a long tradition of naming streets and metro stations after great artists and writers, one that has been recently extended to pop and football stars. The names of several metro stations were changed temporarily over the summer to celebrate France's World Cup football victory, with Victor Hugo becoming "Victor Hugo Lloris" after the team's captain and Champs Elysees-Clemenceau "Deschamps Elysees-Clemenceau" after manager Didier Deschamps. Signs at the Duroc station were similarly altered last year after the death of French rock legend Johnny Hallyday to "DuRock Johnny".